What browser do you use on your mobile device? I think I am one of the perfect users for the iPhone because I don’t really look for much in terms of customizing my settings and apps. For example, I am perfectly content with Safari for mobile browsing as it works – and that is all I really need! From what I hear from Android users, though, the ability to change little details is what gives their devices the edge. If you are an Android user, then you may already be using the Dolphin browser, which has impressed many. 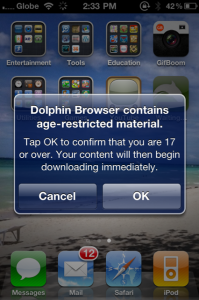 Yesterday, iPhone users got treated to the first release of the Dolphin browser in the App Store. I just checked it out myself and look what I found! 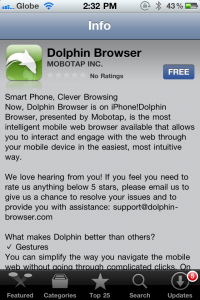 Yup, the Dolphin browser for the iPhone is available for FREE! As satisfied as I am with Safari, I might as well check it out right? Before you can download the app, though, you have to indicate that you are an adult. In the legal sense of the word. 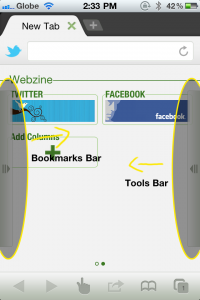 And here is my first look at the Dolphin browser. So why would you want to swap Safari for this zippy alternative? I suppose the gesture feature is the main reason. There are default gestures, but you can also create your own. I have to admit, using those gestures is a pretty fun experience. I would make my own gesture for “Add Bookmark” though as I am pretty sure I’d forget how to draw it! Aside from gesture-based browsing, I also like the fact that the browser incorporates a lot of things that you would have to download as add-ons if you use a different browser. For example, you have the Speed Dial page which gives you the option to immediately go to Facebook, Twitter, or Google. You can also add other sites that you frequently visit. On the downside, while you can install the Dolphin browser, there is no way you can change your default browser. You’ll still have Safari. It’s not so bad. I like having an alternative when I need it.